A sprayer and the Brown House in 1984. The U.S. Forest Service manages most of the land in Oak Creek Canyon. 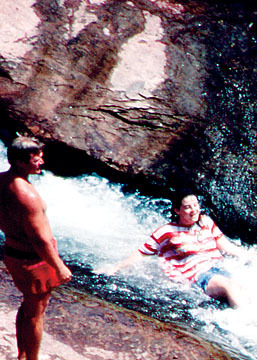 The Slide Rock area of Oak Creek Canyon is one of the most noted and popular tourist locations in the State. Pictures of the area are featured in all forms of media locally, nationally and internationally. Frank Pendley homesteaded the land immediately south of Slide Rock in the early 1900’s and developed a large apple orchard along with vegetable crops. Tom Pendley, his son, continued to operate and manage the property, and in the 1980’s it was one of the largest parcels of land in Oak Creek Canyon in private ownership. In 1982, the family decided it was time to sell the property. When Governor Babbitt learned of this, he contacted the family to see about acquiring the property as a State Park. The Governor grew up in Flagstaff, had visited Slide Rock many times, and was well acquainted with the Pendley family. Tom Pendley told the Governor that he was reluctant to sell the land to a governmental entity because of the difficulties he had experienced in dealing with the Forest Service. At the same time Governor Babbitt was talking with the family, William G. Roe from the Nature Conservancy was corresponding with State Parks Director Mike Ramnes, to let him know the property adjacent to Slide Rock was for sale. In 1983, Governor Babbitt created the Arizona Parklands Foundation and appointed members comprised of business, political and community leaders. In creating this Foundation, the Governor was implementing one of the recommendations that had come from the Governor’s Task Force on Parks and Recreation in Arizona, a special task force the Governor had appointed the year before. The Foundation was a non-profit corporation charged with acquiring property and receiving gifts for State Parks. All land the Foundation acquired would be donated to Arizona State Parks. Working with the Parks Board, a list of desirable properties for future State Parks was developed, including the Pendley property. After two years of negotiations, an agreement was reached with the Pendley family for sale of the property. 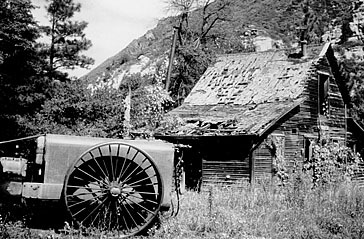 This was the first property acquired by the Foundation. A visitor enjoys the Slide in 1986. Now the Foundation had to come up with the necessary funding to complete the transaction. The Governor assisted the Foundation in working with four major banks to secure a loan to acquire the property. The banks that agreed to loan the $4,000,000 were The Valley National Bank, First InterState Bank, Arizona Bank, and United Bank of Arizona. Shortly after the loan was secured, the Foundation purchased the Pendley property on February 7, 1985, for $3,600,000. The Foundation soon learned they were not going to get the anticipated donations to support the acquisition of the Pendley property. The Foundation, Arizona State Parks Board, and the Governor, working in concert, requested that the legislature provide funding for the acquisition. Early in the 1985 session, House Bill 2391 was introduced which provided a State Park Acquisition and Development Fund, authorized the acquisition, development and operation of the Pendley Homestead, Oracle Site, Davis Camp, Hualapai Mountains, Yuma Crossing, and Picket Post House as State Parks, and made an appropriation. This bill received some strong criticism from a number of legislators especially Senator “Hal” Runyan, Chairman of Senate Appropriations, who stated he had been told the Parklands Foundation would be responsible for funding any acquisition it pursued and no funding would have to be appropriated by the legislature. Senator Runyan further stated, “These kinds of actions and requests just fulfill my prediction that we have gotten into something we should not be in.” In spite of the criticism, the bill passed and State Parks proceeded immediately to acquire the property. A celebration was held on the Pendley property on June 21, 1985. The invited guests included Governor Babbitt, the Parks Board, the Foundation Board, legislators, local officials, Pendley family members, individuals from the community, and State Parks staff. The State Parks Board acquired the Pendley homestead on July 9, 1985, for $3,757,324.65 from the Arizona Parklands Foundation. The Pendley homestead included the homestead house (1927), an apple packing shed (1932), three tourist cabins (1933), the Brown house (1926), and the historic apple orchard. Now that State Parks had the property adjacent to Slide Rock, the agency worked with the Forest Service to confirm the concept initiated by Governor Bruce Babbitt and Regional Forester Jean Hassell for the management of Slide Rock to be integrated into the State Parks operations. This was accomplished when the two agencies signed a Memorandum of Understanding in August of 1986. A small private in holding existed between the Park and Forest Service land. As a result of efforts from the Foundation and Parks Board members, this property was graciously donated to State Parks by Burns International, Inc. on September 9, 1987. The initial Park development included: a new entrance, paved interior roads and parking areas, walking paths, as well as renovation and restoration on several of the existing buildings. With these improvements in place, Slide Rock State Park officially opened to the public in October 1987. The first Park Manager was John Schreiber. During the negotiations to acquire the Pendley homestead, Tom Pendley and Charles Eatherly became well acquainted. Because of this friendship, Mr. Pendley made a major donation of irrigation pipe and equipment and farming equipment to State Parks. The agency was so appreciative of these gifts that Tom Pendley was given a Life Time Pass to State Parks by Executive Director Don Charpio.